The current diplomatic rift between Israel and Turkey is just a symptom of a wide and sickening phenomenon: Israel, Jewish lobbies and Jewish ethnic campaigners around the world are employing different means to conceal the truth about the Jewish national project and its grave inhuman implications. 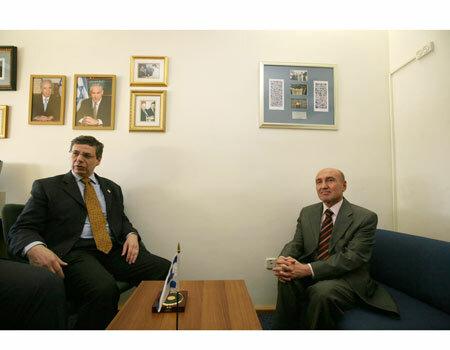 An Israeli official would use a low seat together with an arsenal of abusive bad manners to snub a foreign diplomat, the Jewish ethnic Campaigner in the left would cry anti-Semitism in order to impose a total paralysis onto the anti Zionist discourse. In their universe the Jew never takes responsibility. In their segregated planet, the Jew never regrets or repents. The Goy, on the other hand, becomes subject to insults for just telling the truth or even for being associated with the truth. If Israel and its supporters believe that they can maintain this tactic for much longer, they are pretty deluded. The tide is changing. Humanity is primarily grounded on truthfulness. Hope is fuelled by our capacity to say things as we see them. In that respect, Turkey is a light at the end of the tunnel. As it happens, it is Turkey’s TV and Turkish leaders who are willing to say in the open what our ‘liberal’ leaders fail to admit or even spell in their minds. Truth is not on Israel’s side. In fact, truth is becoming the biggest foe of the Jewish national project, its phantasmic narrative and its fictional notion of history. The Israelis know that truth will prevail. They have good reason to panic. The wall of defiance is emerging around them and their supportive lobbies.